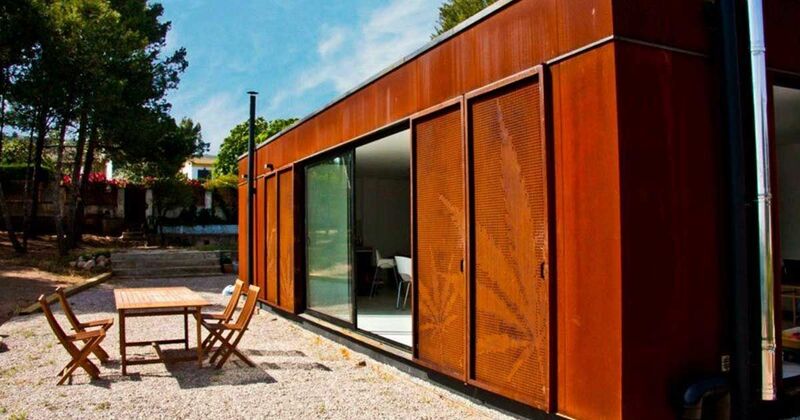 Brace yourselves for a modular home with intriguing aesthetics. James and Mau Architectura, in collaboration with their auxiliary company Infiniski, wanted their Menta House to fulfill a sustainable, energy-efficient vision. The holiday getaway, nestled in Spain's Tarragona province, was completed in 2011 - and has been making its mark in the container living world ever since. You'll soon see that this countryside dwelling is brimming with rich visual elements that make it distinctively alluring. Perforated panels, shaped to look like mint leaves, are the standout feature of this humble abode's exteriors. Another view from the front. Part of the company's eco-friendly concept was to create a home that can be deftly opened, closed, heated and cooled as needed. You can easily access the Menta House's bedroom on the side. While you're passing through, you'll be greeted by a lovely outdoor sanctuary. White is the color of choice for the invigorating interiors. A compelling glass table, combining the best of the rustic and contemporary worlds, invites us to delve into the open-plan living area and kitchen. At night, the leafy patterns actually create an interesting shadow effect. This home's living area is pleasantly enveloped by contemporary furnishings, including a futuristic rocking chair. Along with a lantern-like lighting fixture, the dining area beckons us to admire its modish chairs. 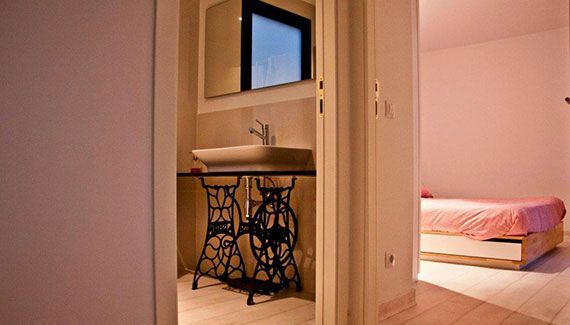 A rosy tint charms us as we meekly peek at the bathroom and bedroom. Don't you just love the artful details lining the basin? Architects are always pushing new boundaries, and the Menta House is a nice spin to this convention. Adeptly furnished and visually sound, this is one container home that was created to leave a long-lasting impression.